SAE O-ring face seal (or S-Seal) fittings are manufactured in conformance to SAEJ1453, MIL-F-18866 and ISO 8434-3. They are intended for general applications including hydraulics and vacuum systems. They also have been specified in numerous alternative fuel applications for connecting compressed gas lines.SAE O-ring face seal fittings are for any piping system design which requires the performance advantages of an ORFS fitting and an underlying specification (SAEJ1453 and ISO 8434-3). There are over twenty-one different body shapes and straights for tubing from ¼” to 1-1/2” available as SAE standards. In addition, SSP can manufacture S-Seal fittings with other types of ends if the standard configurations do not meet your needs. Nav-Sea O-ring face seal (or P-Seal) fittings conform to the requirements of Naval Bureau of Ships (BuShips) 810 series drawings for fluid and gas service up to 3,000 psi. This fitting system is also widely used in general industry and test laboratory environments to system pressures limited by the specifications on the tubing (see Pressures section for more detail). There are twenty-one different body shapes and straights for tubing from ¼ to 2”. SSP’s P-Seal can be used interchangeably with CPV’s Mark VIII Series. HP O-ring face Seal (or Q-Seal) fittings are the most heavy-duty ORFS fitting. It conforms with the requirements of Naval BuShips Series 803 drawings and are also available in additional end styles. It is for gas and liquid applications ranging from vacuum to 6,000 psi at temperatures from -20° F (-10° C) to 225° F (107° C). 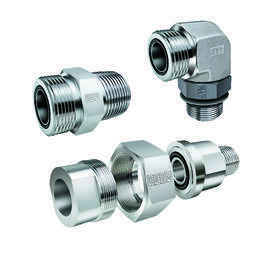 Q-Seal fittings are considered “ship safe” when used in accordance with ANSI B31.1. The three-piece fitting with universal nut allows almost unlimited combinations of end connections in sizes from 1/8” through 2” in both tubing and pipe. SSP’s Q-Seal can be used inter-changeably with CPV’s O-Seal.